Here is a timeline of significant events over the past five months. :: May 5 - Mr Davison, 47, is shot dead at Welsh Street in the Markets area of Belfast. The senior republican backed Sinn Fein’s peace process strategy following the 1998 Good Friday Agreement and was employed as a community development worker in his local neighbourhood. He was linked to the 2005 fight which led to the death of father of three Robert McCartney in one of Northern Ireland’s most notorious killings, but was never charged. His uncle, Terrence Davison, was later acquitted of the murder. :: May 9 - Funeral for Mr Davison is attended by a number of high profile republicans, including Bobby Storey, Eddie Copeland and Brian Gillen. His coffin is draped in an Irish tricolour with a beret and gloves placed on top. 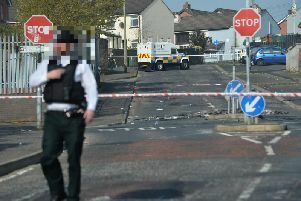 :: May 12 - The Police Service of Northern Ireland (PSNI) say murder investigation is “challenging”, but rule out dissident republican or loyalist paramilitary involvement. :: May 26 - Police reveal an unusual Eastern European weapon was used in the shooting. :: August 12 - Former IRA man Kevin McGuigan, 53, gunned down close to his home at Comber Court in the Short Strand area of east Belfast. Mr McGuigan and Mr Davison had been embroiled in a long-running personal feud and he had been suspected by many within the republican community of involvement in May’s murder. There is widespread speculation that Mr McGuigan was killed in a revenge attack carried out by Mr Davison’s IRA associates. :: August 13 - Stormont’s First Minister and Democratic Unionist leader Peter Robinson warns Sinn Fein it would face expulsion from the power-sharing Executive if the IRA was responsible for shooting Mr McGuigan. Sinn Fein vehemently rejects the suggestion of IRA involvement. :: August 18 - Four men, including IRA Shankill bomber Sean Kelly, are arrested by detectives investigating the killing of Mr McGuigan. :: August 18 - Mourners at the funeral service for Mr McGuigan told violence and revenge do not solve problems. Former Sinn Fein lord mayor of Belfast Niall O Donnghaile, who is from the Short Strand district, the only notable political figure in attendance. :: August 20 - PSNI Detective Superintendent Kevin Geddes says he believes Provisional IRA members were involved in the murder of Mr McGuigan alongside Action Against Drugs (AAD) - a group that includes former IRA members, dissident republicans and criminals. Sinn Fein president Gerry Adams rejects allegations of IRA involvement in the shooting and insists they left the stage in 2005. Mr Robinson reiterates his warning of Sinn Fein expulsion. One of the arrested men - Patrick John Fitzpatrick, 53, from the Lagmore area of Belfast - appears in court charged with possession of a weapon with intent to endanger life. The others detained were released. :: August 22 - PSNI Chief Constable George Hamilton says the IRA still exists, but is not on a “war footing”. Following crunch talks with political figures at PSNI headquarters, Mr Hamilton says IRA are committed to “promoting peaceful political republicanism”. The police chief says he accepts Sinn Fein’s bona fides. :: August 23 - Mr Adams tells National Hunger Strike commemoration in Dundalk the IRA “has gone away”. :: August 24 - Northern Ireland Secretary Theresa Villiers says she is “not surprised” by police assessment that the IRA still exists, but says there is no evidence it is involved in terrorism. :: August 25 - Ireland’s Justice Minister Frances Fitzgerald orders a fresh assessment of Provisional IRA activity. :: August 26 - The Ulster Unionist Party - a minor partner in the Stormont coalition - announces its intention to resign from the Executive, claiming trust in Sinn Fein had been destroyed. Ireland’s police chief, Garda Commissioner Noirin O’Sullivan, insists the force had never denied the IRA still exists. :: August 27 - The DUP claims evidence of IRA activity is of sufficient strength to expel Sinn Fein from the Executive. :: August 29 - The UUP’s ruling executive endorses Mr Nesbitt’s recommendation to withdraw from the Stormont Executive. :: September 1 - DUP leader Mr Robinson meets Prime Minister David Cameron to discuss the crisis. The First Minister calls for a new monitoring body to be established to independently assess IRA activity. The UUP’s sole Executive minister - Danny Kennedy - formally resigns. :: September 3 - Mr Cameron and Irish Taoiseach Enda Kenny order new talks in a bid to resolve the McGuigan murder crisis and other disputes destabilising Stormont, such as the impasse on the implementation of welfare reforms. PSNI chief Mr Hamilton said he would support any new paramilitary monitoring body. :: September 4 - The US administration urges Northern Ireland politicians to seize the opportunity presented by the new talks. :: September 7 - As the Assembly returns from its summer recess, Mr Robinson says he will prevent any meetings of the Executive happening until the situation is addressed. :: September 8 - Ms Villiers convenes the cross-party negotiations but the UUP says it will only take part in discussions that focus on the IRA. :: September 9: Senior republicans Mr Copeland, Mr Gillen and Mr Storey, who is Sinn Fein’s northern chairman, are arrested in connection with the murder of Mr McGuigan. They bring to 16 the number arrested over the murder. Fitzpatrick remains the only person charged with any offence. In response to the latest arrests, the DUP threatens to resign from the Executive if the Assembly is not adjourned or suspended until the crisis is resolved. Prime Minister David Cameron appeals to Northern Ireland’s political leaders to work together as they did during the peace process.